We’d love your help. Let us know what’s wrong with this preview of My friend Muriel by Jane Duncan. Janet Sandison made her bow in My Friends the Miss Boyds, Jane Duncan's sparkling first novel. Here she is again, now a determined young woman of twenty with a University degree. Taking a job with a cranky Pen-Friend organization, she meets Muriel. Muriel is uncompromisingly plain, but clings like ivy. As the lively narrative unfolds, Muriel's story and Janet's diverge and interlace again, aided by a blushing curate, an eccentric she-dragon and her severely repressed husband, by a shady confidence trickster and a suit of armour! To ask other readers questions about My friend Muriel, please sign up. I just reread this for the first time, and while it definitely suffers some first-novel  problems (especially towards the beginning) I still really enjoyed it. 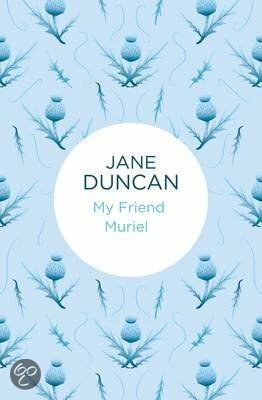 All of Duncan's 'My Friends' books are written in conversational first person by Janet Sandison , and they read as very funny fictionalised memoir . I have no idea how much Duncan was like Sandison in real life, but Sandison is an immensely strong personality, highly opinionated about everything and delighted to share her opinion I just reread this for the first time, and while it definitely suffers some first-novel  problems (especially towards the beginning) I still really enjoyed it. All of Duncan's 'My Friends' books are written in conversational first person by Janet Sandison , and they read as very funny fictionalised memoir . I have no idea how much Duncan was like Sandison in real life, but Sandison is an immensely strong personality, highly opinionated about everything and delighted to share her opinions with the reader. The book is digressive, just as conversation is; Sandison keeps digressing to tell the reader about how strange it is that the titular My Friend Muriel had such a big impact on her life, or to recount an argument she had with My Friend Monica or this that and the other, and this digression is a weakness of the early part of the book, since it's hard to pick out the actual story from the various side journeys. But once the book really gets going there's a gentle plot, very character driven, and a lot of quite funny observations about people. I think my favourite thing about these books is how honest they seem -- nothing else I've read from the period (written in late 50s, but much of the novel is set in the 30s and 40s) gives such a blunt view of human behaviour without any obvious attempt to make a message. Janet is sometimes harsh about others, as young people often are, but she's equally hard on herself, and watching her reminisce about her struggles to understand the variety of human behaviour -- that not everyone is like her, nor should they be -- feels real and refreshing. I'm looking forward to rereading my way through the series, which IIRC stays quite entertaining & blunt, but also develops some real literary technique on the way. 2: Duncan, being meta before her time, also wrote and published books _as_ Janet Sandison -- the very books that much later in the 'My Friends' series her fictionalised self writes. Newly graduated into the Great Depression job market, Janet drifts easily from employer to employer. She fetches up in an office with Muriel, who, for a non-entity, has an inordinately strong impact on Janet's life. What path, Janet muses in the first of many laugh-out-loud meditations, would her life have taken if she had not met Muriel? And all this time, Janet has been trying to help Muriel take control of her own life. The first part of this book can be a bit hard going with too many asides from the main story. But once the story gets going it is an engrossing tale of how Janet meets Twice. As usual, there are many interesting, charming, and/or irritating characters that she meets along the way. I love these books although they were written a long time ago! Jane Duncan a Scot, who lived in the Caribbean,for many years, wrote her books in the linen cupboard because her husband didn't approve. These are funny gentle books that lift your spirit. Duncan also writes as Janet Sandison. The second of Jane Duncan's "My Friend ..." books. Quirky. Based on the life of Elizabeth Jane Cameron (aka Janet Sandison.) I'm on to the next book in the series. Trivia About My friend Muriel.